Thermodynamics is the branch of natural science concerned with heat and its relation to other forms of energy and work. It defines macroscopic variables (such as temperature, entropy, and pressure) that describe average properties of material bodies and radiation, and explains how they are related and by what laws they change with time. Thermodynamics does not describe the microscopic constituents of matter, and its laws can be derived from statistical mechanics. Thermodynamics can be applied to a wide variety of topics in science and engineering, such as engines, phase transitions, chemical reactions, transport phenomena, and even black holes. The results of thermodynamics are essential for other fields of physics and for chemistry, chemical engineering, aerospace engineering, mechanical engineering, cell biology, biomedical engineering, materials science, and are useful for other fields such as economics. Much of the empirical content of thermodynamics is contained in its four laws. The first law specifies that energy can be exchanged between physical systems as heat and thermodynamic work. The second law concerns a quantity called entropy, that expresses limitations, arising from what is known as irreversibility, on the amount of thermodynamic work that can be delivered to an external system by a thermodynamic process. 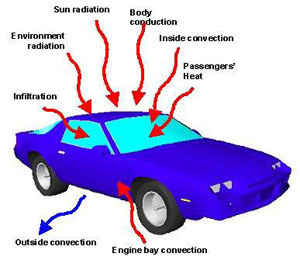 Thermo-dynamics is the subject of the relation of heat to forces acting between contiguous parts of bodies, and the relation of heat to electrical agency. Initially, the thermodynamics of heat engines concerned mainly the thermal properties of their 'working materials', such as steam. This concern was then linked to the study of energy transfers in chemical processes, for example to the investigation, published in 1840, of the heats of chemical reactions by Germain Hess, which was not originally explicitly concerned with the relation between energy exchanges by heat and work. Chemical thermodynamics studies the role of entropy in chemical reactions. Also, statistical thermodynamics, or statistical mechanics, gave explanations of macroscopic thermodynamics by statistical predictions of the collective motion of particles based on the mechanics of their microscopic behavior.